One of the things I enjoy most about rubber stamping is its versatility. For the most part, you can stamp just about anything if you can get ink to stick to it. I'm in the middle of prepping the ribbon for a Crop for A Cure 6 x 6 scrapbook page. Here is a picture of the twill ribbon that I am wheeling with Melon Mambo ink and the Baroque Border Wheel. The ribbon on top is how it looks when you get it. 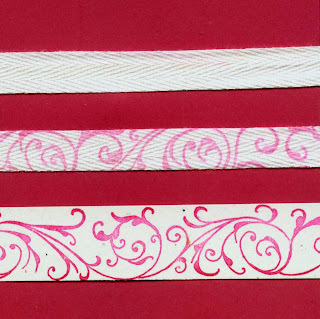 The next strip is how the ribbon looks when it is stamped. The third strip is a piece of paper that I wheeled with the same Baroque Border and ink. You can see how the image is softer and lighter on the ribbon since the fabric soaks up some of the ink. Time to get back to "making baroque ribbon". I'll post a picture of the scrapbook page tomorrow. Here is the supply list if you would like to try this technique. Please share how it works for you.